When you buy from a small business, you’re not helping a CEO buy a third home. You’re helping a little girl get dance lessons, a little boy his team jersey, mams and dads put food on the table. 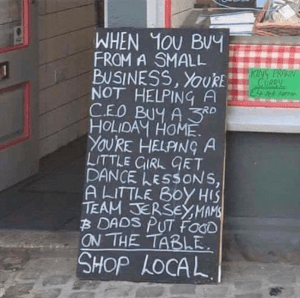 Shop local. – Quoted from a photograph of a chalkboard outside an unknown small restaurant (see image to the left). Big cities can be anonymous places and soon two-thirds of the world’s population will live in them. “In cities we’re so focused on our own fast-paced lives that we forget to appreciate the richness of the world around us,” says Kevin Tayebaly MBA’15J, who along with classmate Jerome Dewavrin MBA’15J co-founded Village Map, a Paris-based startup. How does Village Map do that? By providing a website (villagemap.fr, also available in English) where local and visiting consumers can find and order all the products that exist around them in nearby local shops. About 40 percent of small shopkeepers in Paris have a website but these get no traffic. Village Map centralises these websites on their platform to provide local shopkeepers with traffic and visibility. The duo launched Village Map immediately after graduating less than a year ago. Today they have a staff of 10 and already have signed up 300 local shop owners in 15 Parisian neighbourhoods. The site currently presents 4,000 locally produced products ranging from home decor, furniture, clothing, fashion, jewellery, gourmet foods and wine. Plans are to have 700 merchants from most Parisian districts online by the end of the year, and then to expand Village Map to other cities across Europe beginning with Rome in 2017. The team was able to launch Village Map right after graduation because of how they used their ten months at INSEAD. It was during one entrepreneurship class that Kevin and Jerome met. “We were both pitching the same idea so that’s when we decided to work together,” Jerome recalls. While still taking classes, the duo conducted a pilot programme for Village Map that involved 30 stores. They also participated in venture and social venture competitions. These competitions attracted the attention of venture funds, one of which started a due diligence with Village Map. As vice president of the Technology, Media and Telecom (TMT) student club, Kevin founded the “Paris Tech Tour” after organising a day trip to Paris to showcase the city’s entrepreneurial resources. As a by-product of that trip, Kevin became well connected with the Parisian start-up ecosystem which still contributes to Village Map today. Two weeks after graduation, Jerome and Kevin met with another INSEAD alumnus, chairman of a well-known family retail business who shared the team’s vision of using local commerce as a lever for economic and social development in the city. The company immediately decided to back Village Map and invested €275,000 in the venture. After that, Kevin and Jerome offered the same investment conditions to their ‘15J classmates. They raised €55,000 from 44 investors in 29 countries and created Fonty Capital, a holding company, to represent the 44 investors in a single entity. Village Map is currently seeking to raise an additional €1 million and is conducting a business angel round that will close at the end of June. Village Map has been quick to notch up even more success in the last few months. Kevin and Jerome won the first two contests they participated in, including the Boston Consulting Group’s “Young Social Entrepreneurs of the Year” award. Village Map has also been selected by the City of Paris to roll out its app throughout the capital, not just on smartphones but on 100 new bus station touch screens at the end of May. Speaking of awards, Jerome says that INSEAD’s ranking in January as the best MBA global programme in the world could not have come at a better time. According to Kevin, this includes Google, Amazon, Facebook, Apple and Alibaba who combined are equal to Russia in terms of economic power.